Activated nitrogen-doped carbons (ANCs) were prepared by carbonization/activation approach using aminated polyvinyl chloride (PVC) as precursor. ANCs exhibit larger porosities and higher specific surface areas than those of their nitrogen-free counterparts for the same KOH/carbon ratio. The specific surface area of ANC-1 is up to 1,398 m2 g−1 even at a low KOH/carbon ratio of 1:1. Fourier transform infrared spectroscopy investigation of the nitrogen-enriched resin precursor indicates the efficient dehydrochlorination of PVC by ethylenediamine at a low temperature. The nitrogen content and the population of nitrogen functionalities strongly depend on the KOH/carbon ratios and decrease drastically after KOH activation as seen from the elemental and X-ray photoelectron spectroscopy analysis. The surface concentration of N-6 and N-Q almost disappears and the dominant nitrogen groups become N-5 after KOH activation. 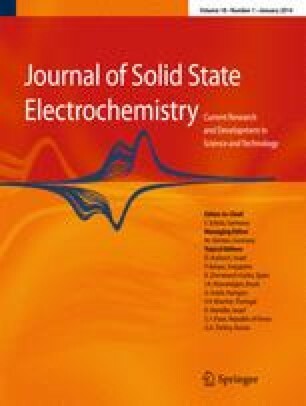 The highest specific capacitance of ANCs is up to 345 F g−1 at a current density of 50 mA g−1 in 6 M KOH electrolyte. ANCs also exhibit a good capacitive behavior at a high scan rate of 200 mV s−1 and an excellent cyclability with a capacitance retention ratio as high as ∼93 % at a current density of 2,000 mA g−1 for 5,000 cycles. This work was supported by the National Natural Science Foundation of China (nos. 20836002, 21003016, and 21276045), the Dalian Science and Technology Bureau of China (no. 2011A15GX023), and China Postdoctoral Science Foundation (no. 20100481227).